Cellphones - MFDC GROUP INC. PLEASE CONTACT US IF YOU ARE A LARGE VOLUME BUYER AS WE HAVE EXCLUSIVE DEALS AVAILABLE FROM THE MAJOR CARRIERS. THIS IS FOR LARGE VOLUME BUYERS. We have NEW factory unlocked, New Carrier locked and Refurbished. 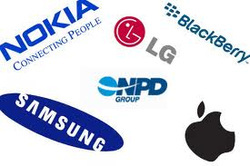 SAMSUNG, APPLE, NOKIA, HTC, MOTOROLA, BLACKBERRY, etc. All items are brand new unlocked. They can be shipped or picked up from Toronto. MOQ is 10pcs..
Toronto, Canada MFDC GROUP INC.